From the pristine waters of Arnhem Land in the north to the spinifex deserts of the Red Centre, the larder is always full for Aboriginal Australians. So closely attuned are they to the rhythm of the land, tempo of the climate and cycles of the natural world that Aboriginal people of the Northern Territory have little trouble finding food…wherever they go, wherever they look, "bush tucker" is at hand. A close friendship between Master Chef Steve Sunk of Charles Darwin University and Aboriginal students throughout the Territory has resulted in a new, Australian cuisine that combines thousands of years of accumulated knowledge about native plants and animals with western-style cooking. Over the past fifteen years as Steve Sunk took his highly popular Back to Basics cookery course to bush communities, he and his students created unique dishes with ingredients common to indigenous Australians but rare to mainstream cookery. From the coastal people of Arnhem Land comes original dishes such as chargrilled crocodile tail with bush tomato salad, shellfish salad with turtle eggs, dugong curry Macassan style, mud crab omelette and stingray balls. The river people from around Daly River inspired wallaby saddle with wild plum sweet glaze, home style magpie goose, barramundi with freshwater prawn bisque and turtle liver risotto with crispy turtle tripe and pilaf rice. Steve worked with the desert people south of Alice Springs to create dishes such as kangaroo tail with pasta, bush turkey casserole, grilled kangaroo steak with fried bush yams and tomato, witchety grubs in pasta and goanna and vegetable stew. 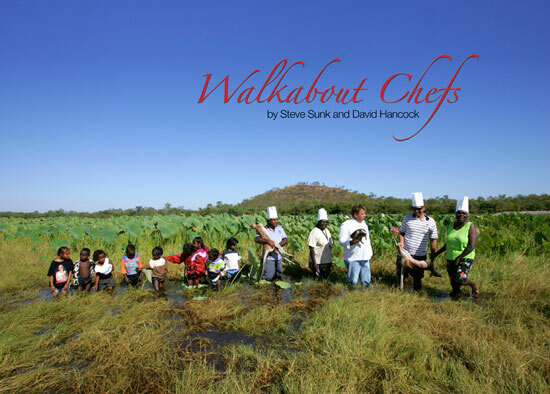 More than 40 dishes, and recipes, are detailed in Walkabout Chefs, a book by Steve Sunk and Australian Geographic photographer/writer, David Hancock. While some of the ingredients are from protected species, such as dugong, turtle and goanna, Steve points out that Aboriginal people have eaten these foods for thousands of years and continue to do so under Australian law. Every recipe contains an alternative ingredient for non-indigenous people, such as pork for dugong and beef or veal for turtle meat. Walkabout Chefs details how Aboriginal people survived so well in Australia before Europeans arrived, how they still know their environment intimately and how plants and animals are entwined with their lives and spirituality. Walkabout Chefs provides an understanding of Aboriginal culture through food. It is a different perspective that highlights Australian Aboriginal culture in the most positive way and explains much about indigenous Australians - their attitudes to country and their lives today. The book, which is broken into three sections, – saltwater, freshwater and desert - takes the reader to vastly different parts of the Northern Territory – along the coast, down the rivers and across the deserts. Few books that encompass such a wide view, are so functional. People can use Walkabout Chefs in their own kitchens. Walkabout Chefs runs over 144 pages, with 80 pages of recipes and food images, with additional photographs and text about Aboriginal concepts of food and traditional cooking styles, hunting techniques and benefits of combining traditional and western styles.